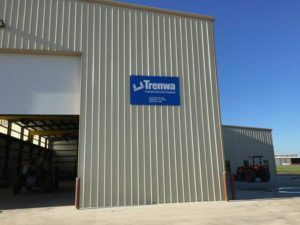 This summer Trenwa has opened a new manufacturing facility in Brookshire, TX. This is our 4th plant nationwide and it’s location allows us to service the Texas and southwest/central markets very economically. The ability to ship to these areas from Brookshire will reduce the cost for our customers significantly. This 17,000 sq ft facility sits on 10 acres of land giving us plenty of room for on site product storage. We installed a state of the art, computer controlled, batch plant from Advanced Concrete Technologies that can produce precision concrete very rapidly. We have also filled the plant with new forms which will allow us to produce very nice looking, high quality product. We look forward to fulfilling your trench requirements from this exciting new facility.